← Are We a Den of Robbers? This past Sunday, friends Scott and Meg Rambo stopped by Hope Church to share about their work in Uganda and where God is leading them. They both shared about the importance of intercessory prayer in the lives of missionaries- and in our own lives. Since we are focusing on prayer in the month of August- this is very appropriate and timely for us. In Exodus 17:8-16, the Israelites are in a battle against the Amalakites. Moses told Joshua that during the battle that he (Moses) was going to stand on top of a hill with the staff of God. Whenever Moses raised his hands and the staff of God, the Israelites were clearly winning the battle. When Moses grew tired and lowered his hands, the Amalekites were winning. 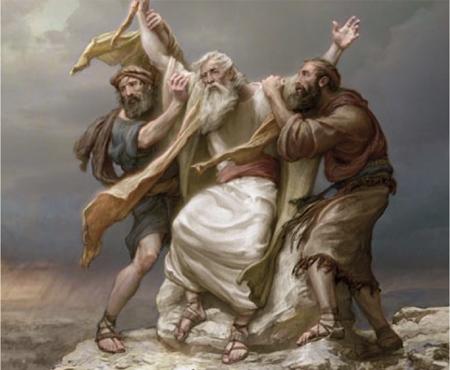 Seeing this, Aaron and Hur- who were with Moses, put a rock under Moses for him to sit on and they held up Moses’ hands throughout the battle so that “his hands were steady until the going down of the sun.” The result? Joshua and the armies of Israel overwhelmed the Amalekites. As Scott shared, this is a great picture of the power of intercessory prayer. When we develop the habit of prayer- and praying for others- we are engaging in a spiritual battle. Many times we are unaware about what the battle is, but we are to pray. There have been many nights when I have been awakened with a person on my heart to lift up in prayer. When we pray, we hold up the arms of the one we are praying for. When we pray, we are coming along side of them in the spiritual realm to encourage, champion, and support as our battle is not against flesh and blood but against principalities and powers. Next time that prayer concerns are shared in your church- write them down and commit to lift them up. Put the prayer card of missionaries in your Bible and when you see them, go to war in the spiritual realm for them and their ministry. When you commit to praying for someone who is far from God- God uses the power of praying men and women to soften their hearts and create divine encounters to experience God’s love and grace through Jesus. This entry was posted in Uncategorized and tagged Prayer. Bookmark the permalink.